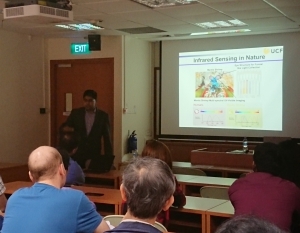 At the invitation of HiFES, Professor Debashis Chanda from the University of Florida presented on Bio-inspired Uncooled Multi-Spectral Infrared Imaging with mK Range Temperature Resolution on 12 Dec at the Electrical and Computer Engineering Department of NUS. 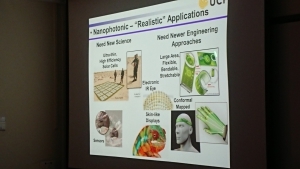 He started off the talk by sharing on the applications of Nanophotonic that spans space exploration, aerospace, epidemic screening, security, energy saving, electronic inspection and more. The market value of IR imaging market is estimated at $11.36b by year 2022. He continued to touch on the limitations of present infrared (IR) detection techniques; which are due to the absence of spectroscopic or “color” detection/imaging abilities. At present all cooled and uncooled MWIR and LWIR detectors are being “bucket” detectors generate integrated spectral images in the binary color format (choices of any two pseudo colors). 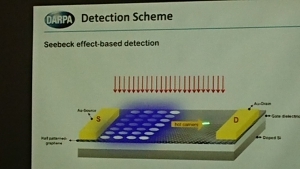 Prof Chanda indicated that very little research work has been performed on frequency selective detection to-date and pointed the audience to see the natural world where one would find many animals are found with the ability to see over multiple spectral bands in the visible as well as in the infrared domain. 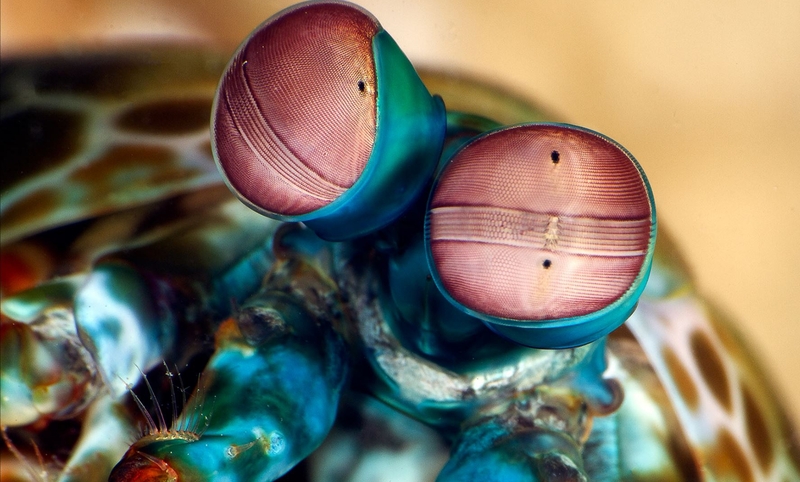 Mantis shrimp eye is an example of a complex eye which is comprised of an elegant 12 channel spectrum sampler that spans the range 300-750 nm, with spectral bandwidth of around 40 nm. These are among the sharpest spectral sensitivities in the animal kingdom. The key aspect of their eye is “biological light funnel” apparatus which collect light over a wide angle with near perfect efficiency. Another biological masterpiece is pit vipers that have heat-sensitive membranes that can detect the difference in temperature between a moving prey—such as a running mouse—and its surroundings on the scale of milli Kelvins. Their infrared eye (“the pit”) has unique abilities to scatter visible light away and transmit only a band of infrared light which reduces background noise substantially. 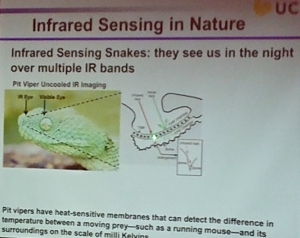 Prof Chanda posed an interesting challenging question in his talk – Can we create an artificial eye/imaging system which has spectral resolving power like Mantis shrimp but viper like detection ability in the infrared domain? He moved on to focus his talk on the multi-spectral sensing/imaging that will provide unique intelligence in terms of spectrally resolved IR signature and/or “color” IR images. 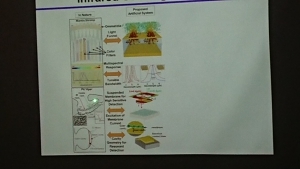 He further shared about the novel printing/imprinting techniques that enable the development of large area, low cost IR detectors which can be mounted on various platforms efficiently with low SWaP requirements. 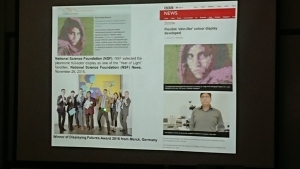 Prof Chanda ended the talk by sharing with great humour on how he moved from the bottom 10 finalist to among the few top winners of Displaying Futures Award 2016 from Merck in Germany. 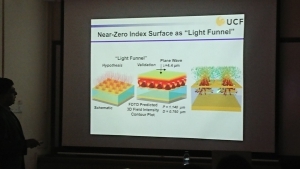 Prof. Debashis Chanda is an Associate Professor, jointly appointed with NanoScience Technology Center and College of Optics and Photonics (CREOL), University of Central Florida (UCF). Dr. Chanda received his PhD from University of Toronto. His PhD work was recognized in the form of several awards, including prestigious National Sciences and Engineering Research Council (NSERC) fellowship. Dr. Chanda completed his post-doctoral research with Prof. John A. Rogers at Beckman Institute, University of Illinois at Urbana-Champaign. Quite a few of this research works were extensively covered by National Science Foundation news, BBC, Daily Mail, NBC, Fox, Science Radio and other national/international media outlets. 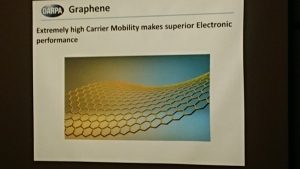 His research has appeared on American Scientist magazine as focused article where it was outlined how companies like Intel, Toshiba etc are trying to adopt some of the printing techniques which were developed in his group. 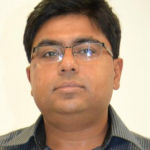 Dr. Chanda is a recipient of the 2012 DOE Energy Frontier Research Center (EFRC) Solar Energy Future Direction Innovation Proposal Award, 2013 NSF Summer Institute Fellowship and International Displaying Future Award-2016 by Merck Germany. Dr. Chanda’s research has been supported by NSF, DARPA, Florida Space Institute/NASA, State of Florida, Northrop Grumman, Lockheed Martin etc.